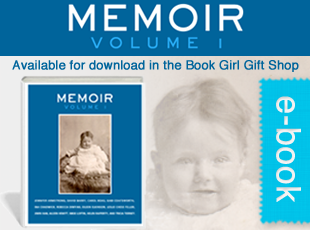 To invite Tessa to visit or Skype with your book club, please email tessa @ bookgirl.tv. For her BIO, please click HERE. 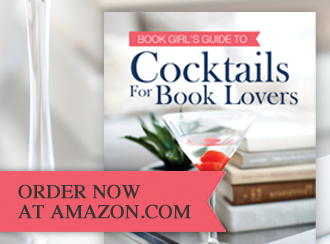 Tessa is author of the Amazon best-seller LONDON ROAD: LINKED STORIES, an award-winning linked short story collection, dozens of short stories and flash fiction, and the Amazon best-seller COCKTAILS FOR BOOK LOVERS (Sourcebooks, Inc). She is founder of the award-winning eChook Digital Publishing, and host/producer of BookGirl.TV, an award-winning digital channel that offers two web series: ‘JUST BOOKS with Tessa Smith McGovern’, an author interview show (and finalist in the 2014 Cynopsis Digital Model D Awards), and BookGirlBUZZ, 1-2 minute book reviews with original cocktails inspired by the book. BookGirl.TV is partnered with Disney’s Maker Studios on YouTube and has over 6 million minutes viewed. Videos are available on all digital platforms and smart TVs. An app called ‘BookGirlTV BUZZ’ is available on Android and iOS. Tessa teaches at The Writing Institute, Sarah Lawrence College, NY, and is founder of the Fairfield County Writers’ Studio in Westport, CT. This moving collection of linked short stories begins with ‘When Janice Bailey Walked’, an award-winning story first published in the Connecticut Review, and continues with six more stories as told by the eccentric residents of Number 17, London Road, thus illuminating a little-known side of the most beautiful city in Europe. During the course of one day, we meet Nora, landlady of the boarding house, a romance novelist obsessed with the Queen, who finds herself hotly pursued by Len, landlord of the local pub. Then there’s Anna, Nora’s teenage daughter, waiting all alone at netball camp because her mother, otherwise engaged, has forgotten to collect her. We meet Bitty, a college drop-out now working in an antique shop, who’s waiting nervously in an Italian restaurant to find out if her American boyfriend is about to dump her, and Isobel, daughter of a Shakespearean actress, in the aftermath of a crisis. Finally there’s Mandy, who must choose between a life of crime or an alternate path. “Everyone has difficult times in their lives and sometimes it feels like they’ll never end. My aim with these stories was to see these characters through difficult, sometimes dire, situations. I believe that the main thing – the greatest success – can often be just to keep moving forward, and that we all deserve love, no matter what we’ve done or who we are. When I was 11, in 1974, my parents divorced after years of being unhappy together. My mother bought a bed and breakfast called the Freshford Hotel in Croydon, Surrey, England, an hour south of London. At that time, Prime Minister Margaret Thatcher was eliminating beds in many of the psychiatric hospitals in Britain and releasing the occupants into bed and breakfast ‘hotels’, like ours. The program was called ‘Care in the Community’ and was supposedly to cut costs and benefit the patients (although detractors claim the purpose was to sell the valuable real estate). For some months, as the switch over from B & B to long-stay took place, we had ordinary bed and breakfast guests staying in rooms next to those of former psychiatric hospital patients. After 18 years of marriage, as a new divorcee, my mother needed to make money. About once a month, she’d rent an already-occupied double room for two hours at lunch time to a man and woman who clearly weren’t meant to be seeing each other. Mum would whip in just before they arrived, change the sheets and hide the suitcases. Two hours later, she’d whip back in, change the sheets again and put the suitcases back where they’d been, all the while praying the room’s legitimate occupants didn’t come home early. Back then, oblivious teenager that I was, I neither appreciate my mother’s anxiety, nor understand that mental illness was a health issue like any other. Luckily for us, our local psychiatric hospital knew my mother was a kind and compassionate woman, and the business thrived until she sold it in 1989. Two of the characters in London Road are based on actual residents of the Freshford Hotel, and the others were amalgamations of different people I’ve known. No real names have been used. The main character in ‘When Janice Bailey Walked’ came to life after I read a newspaper article about a group of women convicts who received longer sentences than men convicted of similar crimes. In ‘The Literature Group’, Mandy was based on a girl I’d met when I was 16 and working as a sales assistant in a jeweler’s in Croydon, Surrey. I’ve forgotten her name, but she was a spotty brunette, very thin, with a pointy nose and quick, bird-like movements. On Saturdays she used to visit Allders, a high street department store, try on clothes and walk out wearing a pair of stolen trousers under her own baggy corduroys. She never got caught, as far as I know. Each time she’d come straight to us and sell whatever she was wearing half price. I’d like to say I didn’t buy anything; I don’t remember, but I probably did. In ‘Lunch at World’s End’, Bitty is based on a woman who was a former psychiatric patient and long-term resident of the Freshford Hotel. I liked her because she didn’t scare me, she was mild-mannered and eager to please. When she was upset, she’d talk faster and faster until her words ran together and she became unintelligible. One day, she attacked my mother, flapping her hands frantically, and Mum, who wasn’t afraid of her, just told her to stop, and she did. Nora, in ‘The Walls of Buckingham Palace’, is a composite of a couple of women I know. Her weekly walk alongside the outside of the wall of the Palace and her obsession with the Queen were born of my own homesickness. Living in Connecticut, which is about as English as you can get in America, I long for the daily TV news about the lives of the older royals. Following the Queen’s activities, especially, is part of growing up in Britain and the absence of those BBC bulletins feels like the loss of a beloved grandmother. ‘Birthday Ballet’ was about the period after my parents announced their divorce and our family disintegrated. My normal teenage separation from my mother was complicated by the divorce and the fact that I’d been away at boarding school since the age of eleven. At a time when many girls hated their mothers, I ached for mine, and was furious and heartbroken when she forgot to pick me up one day because she was watching a Wimbledon tennis match on TV. I felt very sorry for myself, and even as an adult a small hurt persisted until my own children became teenagers, and I understood a mother’s need to re-establish and develop her identity as the kids grow up. ‘Isobel’ is based on a wild-eyed, Amazon of a woman who was a long term resident at the Freshford Hotel. She was the younger sister of a (currently) famous NYC dress designer. Always heavily made-up and beautifully dressed, ‘Isobel’ had originally been sent to Warlingham Park, the local psychiatric hospital, after stabbing her mother. I never knew what became of her mother, or how serious the wound was, and she really did follow my mother from room to room, and I really did worry that she might do to my mother what she had done to her own while I was away at boarding school. The story ‘When Janice Bailey Walked, Part II’ came about as a resolution to Janice’s story. I don’t often write sequels but her story felt unfinished, so I wanted to resolve it. 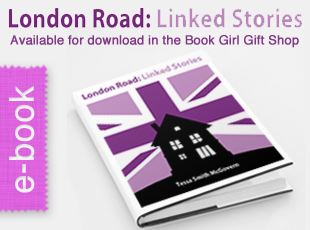 LONDON ROAD: LINKED STORIES can be purchased/downloaded from: Amazon, iTunes, and Google Play. Connecticut Review, CellStories.net, The Dirty Goat, RiverSedge, Studio One, The Distillery, BCtheMagazine, Happy, Georgia State University Review, Portland Magazine. First Offense, Carillon, Lucid Moon, Equinox (archived by the English Arts Council, Southbank Center, London). Facebook: for BookGirlTV please CLICK HERE.